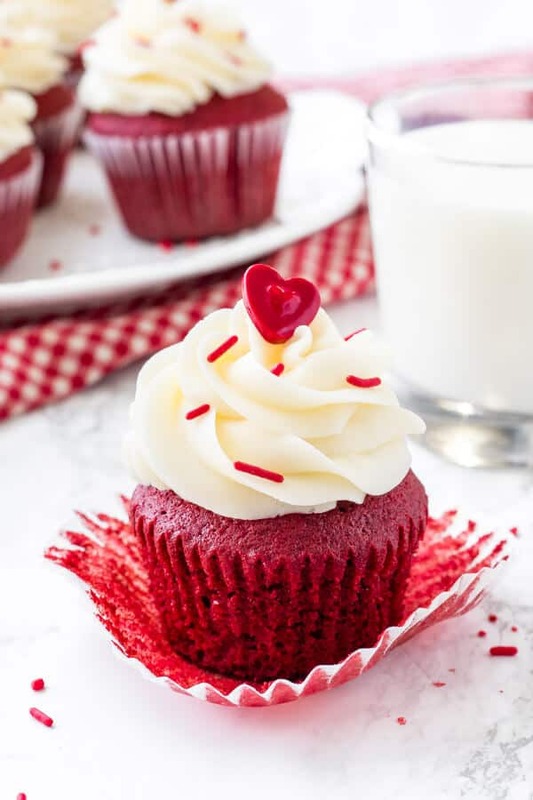 PERFECT red velvet cupcakes have a soft crumb, moist texture, hint of chocolate, and a gorgeous bright red color. 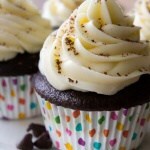 Then they’re topped with tangy cream cheese frosting for the best red velvet cupcake recipe. Finding the perfect red velvet cupcake recipe can be a challenge. Now – I love red velvet cupcakes with cream cheese frosting, but they need to be just right. They need to be moist and fluffy with a soft cupcake crumb. And they have to have a mild chocolate flavor, slight tanginess and a beautiful bright red color. I can honestly say that this is hands down, that these are my favorite red velvet cupcakes. A few months ago I received an email asking if I had a recipe for red velvet cupcakes. And sadly, I had to say no. Yes, I’ve taste tested my fair share of red velvet cupcakes and played around with different recipes- but I didn’t feel like my own recipe experiments were any better than red velvet cupcakes from the bakery. So clearly, I had to do some kitchen research. 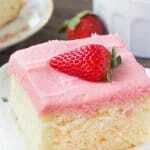 Use cake flour for a lighter, more delicate texture. If you don’t have any cake flour, I’ve included a substitution in the recipe notes. Sift the cake flour and cocoa powder together first to remove any lumps. Use real butter – not margarine. 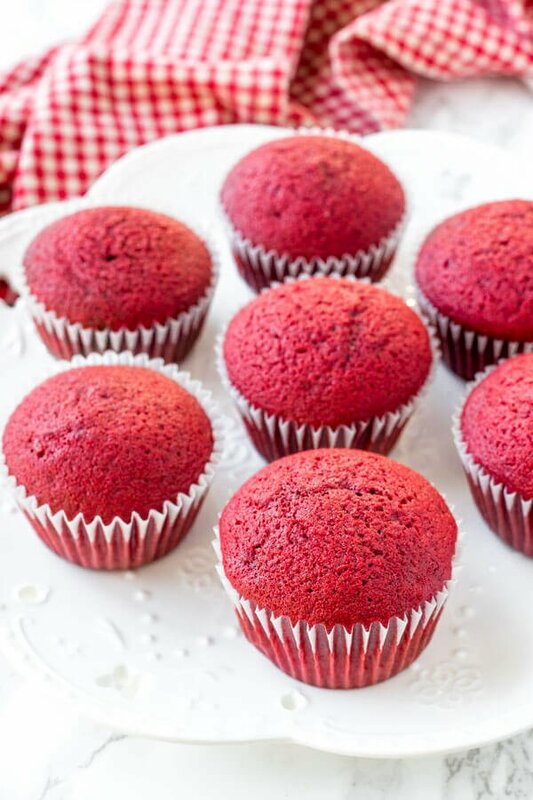 I found that butter instead of oil produced red velvet cupcakes with the best texture and flavor. Beat the butter and sugar together until fluffy. If it still looks like little pebbles – you aren’t done yet. Mix the sifted flour & cocoa powder into the butter mixture about 1/3 at a time, alternating with the buttermilk. This produces cupcakes with the best cupcake crumb. What Makes Red Velvet Red??? The key ingredients in red velvet cake are the cocoa, baking soda, vinegar, buttermilk and of course the red food coloring. (Ok – obviously there are other important ones, but these ingredients give the cake its name). 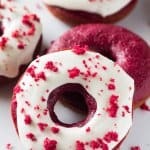 Turns out, red velvet cake wasn’t originally bright red and dyed with food coloring like it is today. When the acid in the buttermilk and vinegar react with the cocoa – they give the cocoa a reddish tinge. 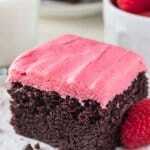 Then over the years, red food coloring was added to the recipe to exaggerate the red color. 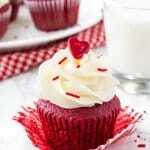 Can you Make Red Velvet Cupcakes without Buttermilk? Yes! Buttermilk creates a super soft, ridiculously moist texture. 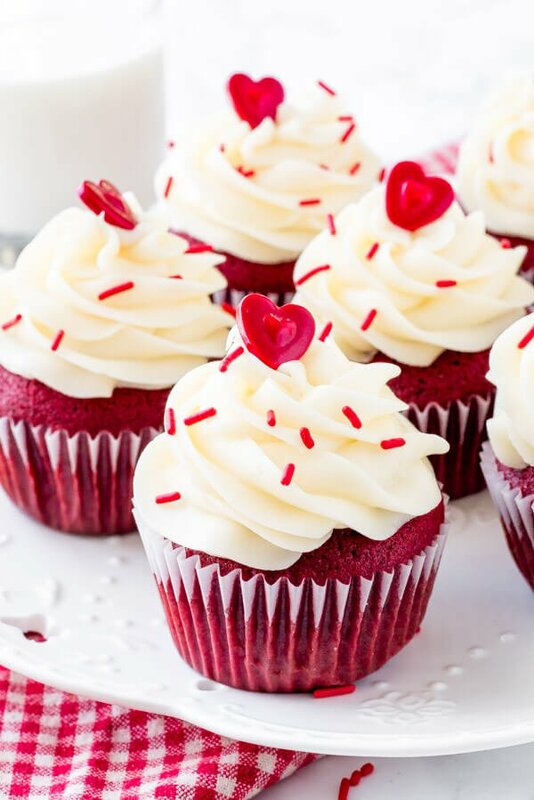 It also gives a slightly tangy taste to the cupcakes that’s key for red velvet. If you don’t have buttermilk though, you can make your own by souring milk with a little white vinegar or lemon juice. Add 1 teaspoon white vinegar (or lemon juice) to 1/2 cup of milk (I recommend 1%, 2% or whole milk). Let stand at room temperature for 5 minutes before using. I think cream cheese frosting is the best reason for making red velvet cupcakes. It’s like a fluffy, pillowy soft mountain of cream cheese goodness. (Or when I asked Jay to describe it, “super tasty”….. Clearly, the engineers have all the best words). It’s made with just 5 simple ingredients: butter, cream cheese, powdered sugar, salt & vanilla extract. If you want cream cheese frosting that’s extra thick for piping, I recommend adding in 1/4 cup of cornstarch. 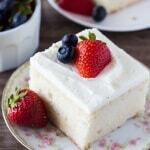 I’ve included my favorite cream cheese frosting recipe into the recipe card below. 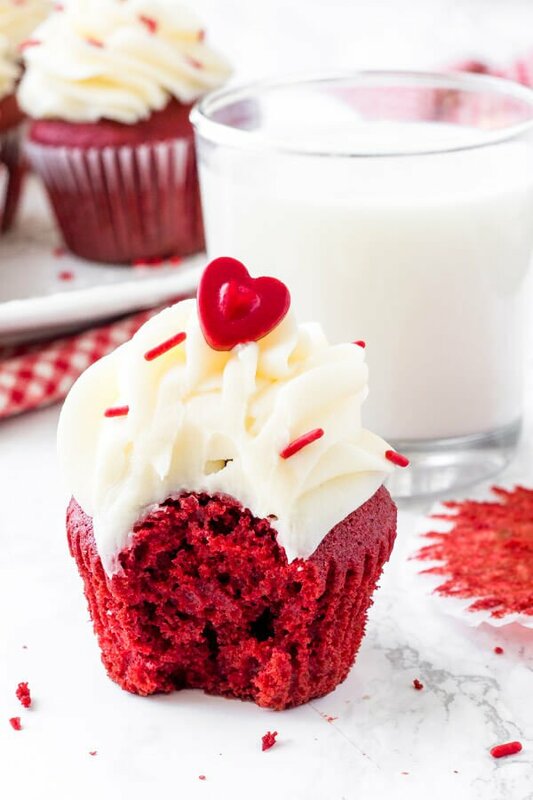 Light & fluffy, perfectly moist Red Velvet Cupcakes topped with tangy cream cheese frosting. 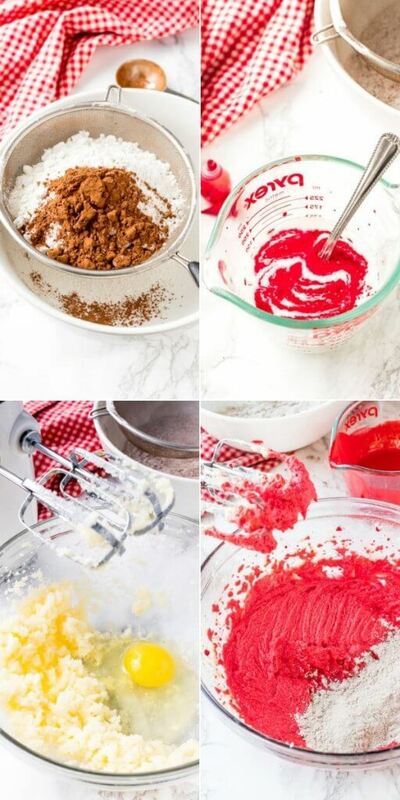 The only red velvet recipe you need! Preheat the oven to 350F degrees. Line a muffin pan with muffin papers. In a large bowl sift together the cake flour, cocoa and salt. Whisk gently. In a separate large bowl beat the butter until fluffy (about 2 minutes). Then beat in the sugar until creamy (about 1-2 more minutes). In a liquid measuring cup whisk together the buttermilk and red food coloring. Beat the dry ingredients (flour mixture) into the butter mixture about 1/3 at a time, alternating with about 1/3 of the buttermilk mixture. Turn off the mixer and scrape down the sides of the bowl as needed. In a small bowl or cup dissolve the baking soda into the vinegar. Quickly beat it into the cupcake batter. Spoon the batter into the prepared muffin papers, filling each about 2/3 full. Bake in the preheated oven for 15-18 minutes, or until an inserted toothpick comes out clean. Allow the cupcakes to cool in the pan for 5-10 minutes, before removing from the pan and continuing to cool on a wire rack. Mix in the cream cheese until evenly combined. Then add in the vanilla and salt. In a separate bowl sift together the powdered sugar and cornstarch (if using). Beat the powdered sugar into the butter and cream cheese mixture about 1 cup at a time, starting with the mixer on low and turning it up to medium speed as the sugar incorporates. Frost the cooled cupcakes using a piping bag and tip (I used a 1M) or a knife. *If you don't have cake flour, measure 1 1/3 cups all-purpose flour. Remove 3 tablespoons, and add in 3 tablespoons of cornstarch. Sift the mixture together 3 times. **If you don't have buttermilk, add 1 teaspoon of white vinegar or lemon juice to 1/2 cup milk (I recommend 1%, 2% or whole milk). Let it sit for 5 minutes to sour before using. ***Store cupcakes in an airtight container at room temperature for up to 8 hours, or in the fridge for up to 3 days. Remove the cupcakes from the fridge 1 hour before enjoying. Hi! In the description, you mention the key ingredients being vinegar and buttermilk, but I don’t see the vinegar anywhere in the ingredient list and it’s not referenced in the instructions. Is this missing from the post? Thanks! Do just the eggs ahave to be room temp or does buttermilk need to be room temp as well? I recommend having them all at room temperature – You can speed up the process by placing the eggs in a bowl of warm water for a few minutes, and microwaving the buttermilk for about 15 seconds. Hi can I omit the shortening from the frosting?